Holmefield Farm Services based just outside York in North Yorkshire is a specialist in pig veterinary services but also caters for large animals such as cattle and sheep. In addition they supply medication and specialist veterinary feed for their patients and as such need a large warehouse to store these specialised products. As their business grew, they decided to construct a modern purpose built head office and warehouse that would suit their needs now and into the future. They liked the idea of a lovely free open space that would create a light and friendly atmosphere for staff and visitors alike. The offices were built over two floors and private offices were required as well as keeping the open space idea. 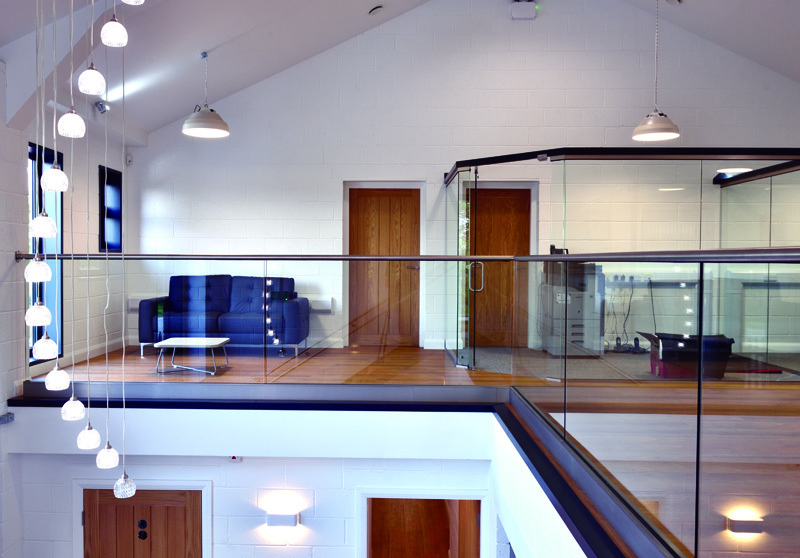 Arkoni the specialised glass and framing company were approached who suggested a plan to create separate offices using glazed screens with fire rated glass as well as constructing balustrades and fire escape staircases. As you can see from the photographs, the result answered all the client’s requirements and gave a modern yet practical alternative to the traditional stud walling. Glass screens can provide a light open feel to any environment and Arkoni can design and build to any requirement.